Rossi’s been going over some of the new lore regarding the Artifact weapon reveals for Legion, and I’m going to jump into the fray as well, because there is a lot of material hidden among all those little introductory paragraphs we got for our new weapons. With so many new weapons and so much new lore, it’s hard to choose just one class, but the Priest weapons introduced have a lot to offer — particularly given the new twist for Shadow Priests in the upcoming expansion. Sure, Shadow may be fascinating, but that doesn’t mean that Discipline and Holy haven’t gotten some eye-opening information as well. Priest Artifact lore is a little all over the place in terms of where we’re looking at with lore, which is interesting in and of itself, largely because the origins and history of the Light are just as enigmatic and unknown as where all that Shadow magic really comes from. So let’s take a look at what Priests are going to be seeing in Legion, with regards to Priest Artifact lore. According to the official preview, Discipline Priests are the balance between Light and Shadow — they wield both, and stand on that line in between the two. Light’s Wrath is pretty unique in that it was the Scarlet Crusade’s attempt to create a second Ashbringer — an attempt that was thwarted by “a dreadlord who had infiltrated the order,” which implies Balnazzar. Balnazzar possessed the Grand Crusader of the Scarlet Crusade, Saidan Dathrohan, in the early days of the order’s creation. It stands to reason he’d oppose the creation of a weapon that could be used to one day cut down the Burning Legion. What’s interesting is that Ashbringer itself was created using a mysterious dark crystal that Highlord Alexandros Mograine found during the Second War. He took the crystal from the body of a dead Orc Warlock — and it was the only crystal of its kind in any historical record. 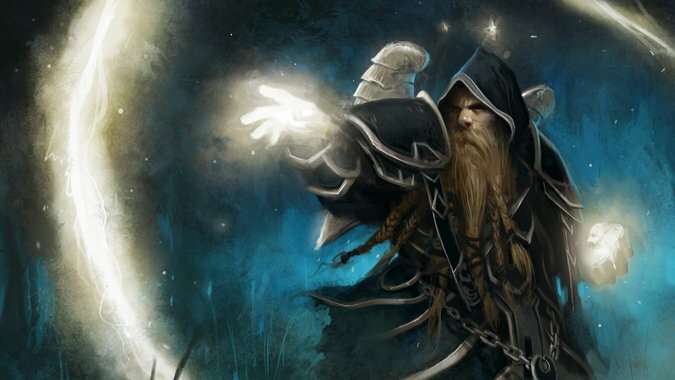 When Mograine took the crystal to the leaders of the Silver Hand, he suggested that they try to search for its antithesis, some kind of manifestation of the Holy Light. Appalled at the dark crystal, the leaders tried to destroy it with a Holy spell, only to have that spell consumed. As they continued to feed the Light’s powers into the crystal, it transformed into the very manifestation of Holy Light that Mograine had suggested they search for. You can see this whole sequence play out in the Old Hillsbrad Foothills instance in the Caverns of Time — just head to Southshore and hit the inn. But this particular crystal was always thought of as unique, however — there was never mention of another crystal being found, but apparently the Scarlet Crusade either discovered one, or thought they had the means to create one themselves. Either way, their attempts were unsuccessful, and the staff itself was deemed so dangerous that it was hidden away by the Kirin Tor. Not studied, not tested, simply hidden away — because nobody could wield the staff safely. What’s interesting here is that connection to Ashbringer — and hopefully through the discovery of Light’s Wrath, Priests will also uncover more about the origins of Ashbringer, or maybe even the origins of the Light. As beings of Holy Light, the benevolent naaru rescued the draenei from their homeworld after most of its people were transformed into demonic recruits for the Burning Legion. Demons nearly overwhelmed the fleeing draenei, but the naaru protected the refugees with this beacon crystal. Tuure channels the Light’s essence into healing radiance, regenerating horrific wounds and bringing people back from the brink of death. Ultimately the crystal was lost to Legion forces on an invaded world. It hasn’t been seen since. This particular entry got me excited from the first sentence, but I’m still puzzled by it — specifically by the phrase “As beings of Holy Light.” This could be taken a few different ways: Naaru represent the Holy Light, or Naaru are actually beings of Holy Light, literally — as in, they are composed of the Holy Light. They are the physical manifestation of the Holy Light. This is supported, in a way, by the creation of Blood Elf Paladins in Burning Crusade, as they were obviously able to siphon the Light directly from M’uru. But it’s something that’s never really been confirmed either way, and unfortunately the statement here is too ambiguous to really say for certainty what the Naaru are one way or the other. However, Tuure is a beacon crystal, one that was used to protect Eredar refugees as they fled Argus and became what we now call the Draenei. Argus wasn’t the only world they fled — the Burning Legion pursued the refugees relentlessly over the course of however many thousands of years transpired between the original flight from Argus and their arrival on Draenor. Tuure was lost on one of these worlds, and didn’t make the trip to Draenor. Presumably, Holy Priests are going to have to go find it. What I find kind of fascinating about Tuure isn’t its properties, but the fact that it’s a “beacon crystal.” And the only reason I find this fascinating is because there are a lot of beacons scattered all across Azeroth and Draenor. 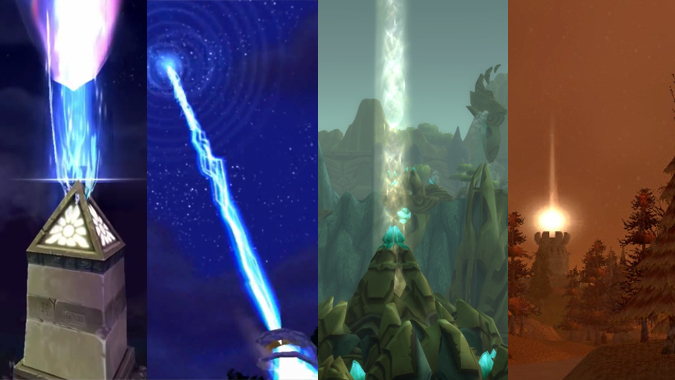 Some of these beacons are implied to be Titan-related, while others, like the Light streaming forth from Shattrath City in Outland, merely seem to be a column of Light emitting from the Naaru. I always thought maybe there was a connection between the two, but there’s never been any evidence or lore supporting the theory. However, Tuure looks like it’s going to be the best weapon for a Holy Priest to wield in the face of the Burning Legion, given its origins and the fact that it’s been used to heal and shield from the Legion’s forces before. Let’s just hope nobody loses it this time around. This terrifying dagger was made from the claw of an Old God eons ago, and dark priests used it for ritual sacrifices during the height of the Black Empire. 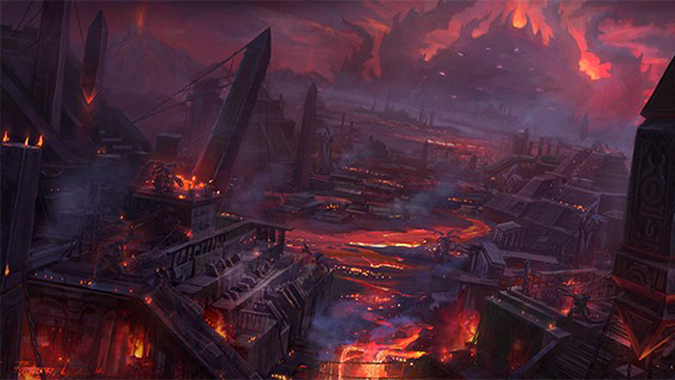 After the fall of the Old Gods, Xal’atath was hidden away by cults. It has surfaced from time to time over the course of history, inevitably associated with some horrific ritual or disaster. The blade has a will of its own: it uses powerful Void energies and mind magics to warp everything around it for some nefarious purpose. This is where things get weird — and beyond the whole “Hey, what’s the Black Empire?” kind of way. 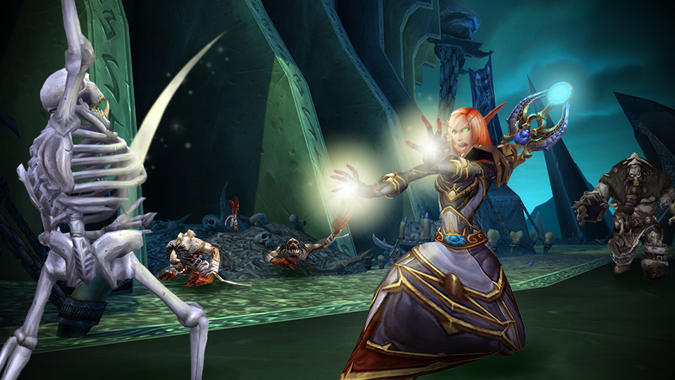 In the Legion Class Preview, Shadow Priests finally got some definition to their class and the powers that they wield. It’s Void magic — the kind of Void magic that strays dangerously close to the domain of the Old Gods. Because of this, the weapon of choice for a Shadow Priest is the claw of an Old God, which is at once a powerful prospect and a really terrible idea. Anyone remember what happened to that one Warchief who decided freeing the surprisingly chatty heart of a presumably dead Old God was a pretty keen idea? Right. Shadow Priests are messing with the kind of magic that could turn them from masters of Shadow to the kind of babbling lunatic that could have an intelligent conversation with Cho’gall, and that’s not necessarily good news. Here’s the odd part of this, though — this is Void magic. When’s the last time we heard about Void magic? Oh, that’s right, that magic that was pouring forth from K’ara, the injured Naaru who entered the Void state of the Naaru life cycle. Let’s just let that sink in a little, all right? That’s right: A natural part of the Naaru life cycle involves entering a Void state. The Void is magic that is similar to the magic we find with the Old Gods. Cho’gall on Azeroth was really keen on chatting with and serving C’thun, an Old God. Cho’gall on Draenor was really keen on chatting with and harnessing the power of the dying Naaru K’ure, going so far as to hasten the Naaru’s cycle so that it entered the Void state faster. Starting to see the disturbing parallels just yet? What if there’s a connection there we haven’t quite considered just yet? I’ve been considering it, and the implications are staggering. Next week, we’ll take a Tinfoil Hat look at just what the Void really is — and possibly even draw some sobering conclusions about Shadow Priests and the Old Gods while we’re at it.